New inventory is here and we are well stocked, come take a look!! "The empowering aromas in our products were used by ancient saints of different spiritual traditions who experienced their various qualities. Over centuries, they combined them in numerous ways to create certain atmospheres and moods, optimizing the conditions for inner growth. 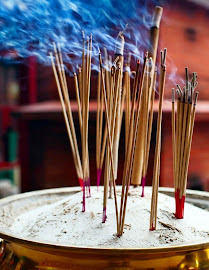 Our range of natural products comes from different spiritual origins, including stick incense from Hindu and Buddhist heritages, smudging herbs traditionally used by Native Americans, herbal resin incense blends combined by shamans, pure frankincense and myrrh burnt in Christian churches, and perfume attar oils worn by Sufis during prayer. This variety of sources reflects our message of love and tolerance for all religions and human beings, seeing one Divinity behind all names and forms. Our products carry a special touch of spiritual energy, which our satisfied customers often testify, as they are filled with sincere devotion, infused with sacred mantras, and contain aromatic items that are selected individually to calm the mind and purify the heart. Each product of our wide variety is personally examined by Prabhuji, who carefully tests their effects during meditation, choosing those that are especially beneficial to purify and balance the mind, and create a spiritual environment. Our aromatic products do more than fill one’s space with alluring scents: they help to fulfill intentions, stimulate energetic centers, evoke romance, uplift moods, facilitate meditation, and inspire devotion. In addition to their exquisite fragrances, many of the natural ingredients in our products have medicinal qualities, enhancing them with vitality and power. At Prabhuji’s Gifts we believe that the spiritual vibrations and the approach of service and sincere will to share infused our products. Therefore, the manufacturing process is performed with mantras chanting and spiritual music sounds."